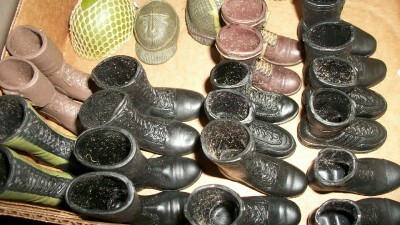 Assorted mfg helmets (17) and (10) pairs asst boots. Boots are not marked. 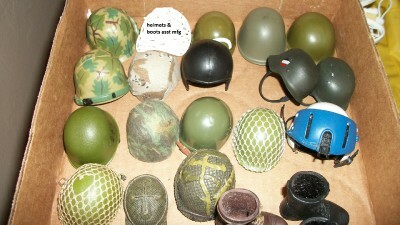 Most helmets are not marked, some may be Joe's as they came with large vintage Joe collection. Couple century 21st marked. Lot Includes Police copter helmet, 2 netted (one torn and both have buckles) 2 cloth covered, 1 green plastic helmet has buckle only, missing clasp, but both straps. All sold as is. 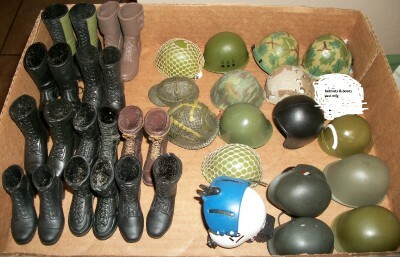 17 helmets total and 10 pairs of boots. Note, mfg not confirmed. This is a good accessory lot to complete uniforms or for diramas.